KTS-470R10LC, the latest generation Win-CE total station that features new hardware design and abundant onboard measuring programs. 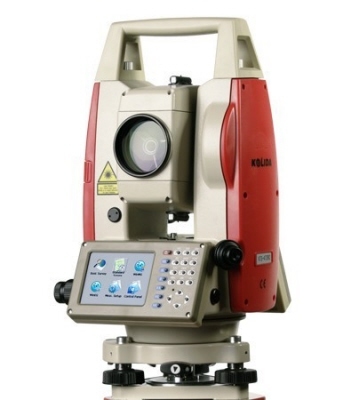 You can use computer, then you can use our KTS-470R10LC total station. Regardless of your profession, no experience needed. From simple tasks to professional all-day use, enjoy the benefits of simplicity and functionality with KTS-470R10LC. The newly upgraded distance measuring systems are ready for 800m Non-prism Measurement. With better stability, and shorter time, KOLIDA 470R10LC maximize you working efficiency. Larger, clearly visible, smart LCD touch screen allows you to view and edit data with ease. Just work the way you want, show the data in graphic display. With advanced electronic compensators, KTS-470R10LC can level and correct collimation errors quickly. Dual-axis compensation on KTS-470RC can assure you the maximum reliability with both Horizontal and vertical angles. Battery capacity has been increased to 3100mAh, while charging time has been reduced. The newly upgraded sensor can auto correct atmospheric and temperature parameters.